Starting Saturday and continuing through today, the University is hosting Yale Engineering and Science Weekend (YES-W), an effort to show Yale off to 108 applicants who have received “likely letters” indicating their probable admission. YES-W is part of the University’s larger initiative to advertise Yale’s science and engineering offerings to prospective students, and is happening for the first time this year, Deputy Dean of Undergraduate Admissions Jeremiah Quinlan said. The weekend features a variety of events including a science symposium at which current undergraduates presented their research, a science-focused extracurricular bazaar, and a tour of the School of Medicine led by David Hafler, chair of neurology and professor of immunology. Though YES-W had initially been intended to host 60 to 80 prospective students, Quinlan said prospective students showed so much interest and enthusiasm for the event that the planners expanded it to over 100. Two prospective students said the weekend was already changing their impression of Yale’s offerings in the sciences. Elaine Zhou, an applicant from Florida, said she had thought Yale was mainly focused on liberal arts, but that this weekend was showing her another side of its reputation. Felicia Hsu, a recruit from Southern California, and Michael Wu, from New Jersey, said they were impressed by the special attention they were receiving this weekend. Hsu added that one of her main goals for the weekend was to learn about research opportunities for undergraduates. At the science symposium, Devi Mehrota ’14 — who presented about her research on rhodopsin, a dim light receptor in the eyes — and other Yalies emphasized the accessibility of research as an undergraduate. 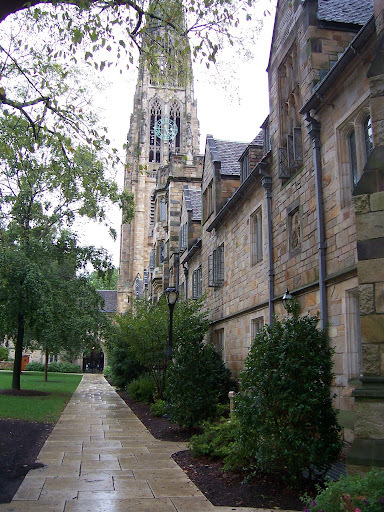 Josh Ackerman ’14, part of the seven-member team of YES-W student coordinators that helped the Admissions Office plan the weekend, said the planners of YES-W were not trying to overwhelm the prospective students with material telling them to come to Yale. The weekend’s offerings ranged from academic to light-hearted. In a hands-on activity called “Junk Yale Wars” Sunday night, prospective students and current Yale science students worked in teams to make a “Rube Goldberg Machine” — a device that could move a small ball for 30 seconds and make a noise at regular intervals — by hammering together random items such as pipe cleaners, multi-purpose cement, and wooden shingles. “Get ready to get dirty,” Assistant Director of Admissions Ayaska Fernando said to the prospective students before the event began. Back in January, Quinlan said the Admissions Office wanted to make sure the weekend was special, especially because of the inhospitable weather typical of mid-February. Today is the last day of YES-W. Prospective students are touring of the Medical School and Yale-New Haven Hospital, having small group lunches with various faculty members and attending a Master’s Tea with Thomas Steitz, 2009 Nobel Prize winner in chemistry and a Sterling professor of molecular biophysics and biochemistry.